On the 6th of September 2018, India joined many other parts of the world in decriminalising homosexuality and homosexual relationships by making section 377 of the Indian Penal Code unconstitutional. This is a landmark step for India as well as the other countries who have taken similar courses of action. 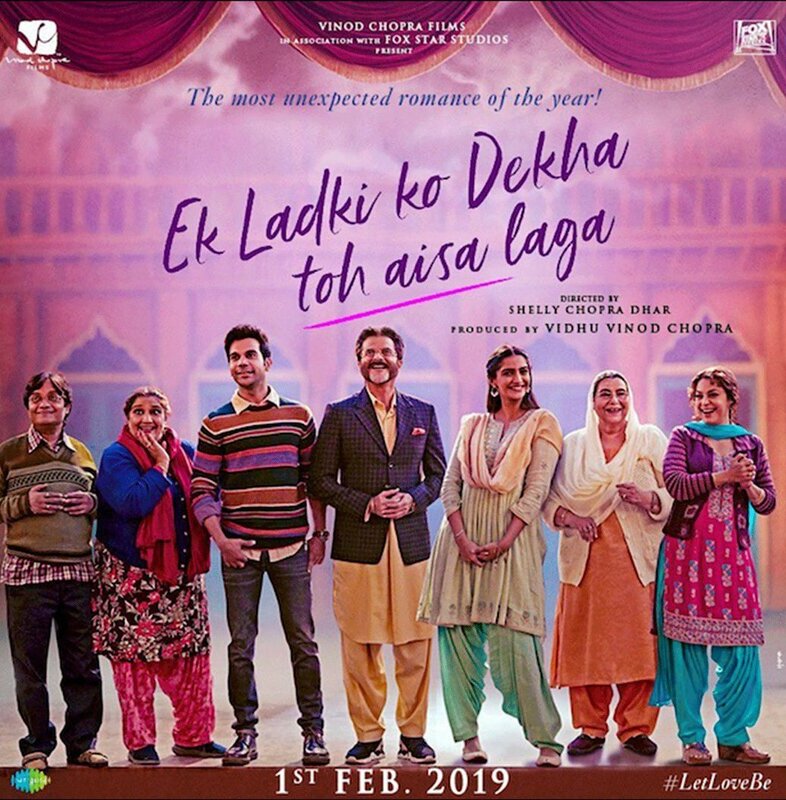 Shelly Chopra Dhar brings together a star cast under Vidhu Vinod Chopra’s banner to explore how it all works in everyday reality through her new film Ek Ladki Ko Dekha To Aisa Laga. Some will instantly cast their minds back to the legendary R.D. Burman’s last album 1942: A Love Story where Kumar Sanu sang for Anil Kapoor as he tried to describe the feeling of meeting a girl (the girl for him) for the first time. So, the music director Rochak Kohli has big shoes to fill if he is to make a successful album here. Not only is the hand of music history weighing down one shoulder but on the other is the hand of such a powerful story being told for the first time. Rather than avoiding it, the title track is Ek Ladki Ko Dekha Toh Aisa Laga. The lyrics have changed, the instruments are more enhanced with the single drum and acoustic guitar of the original added to by a harmonica and finger clicking. Darshan Raval is a very different singer to Kumar Sanu and Punjabi lyrics shift the feel of this song. Nevertheless, that tune, that feeling, that sound is inescapable. Even though the song is only 2 and a half minutes long the listener is taken off to a new dreamland and keeps finding the anchor to come back to a world where Ek Ladki Ko Dekha To Aisa Laga. Just as the old song says “Jaise khilta gulab, jaise shayar ka khwab” (you know the rest!) an old time R.D. Burman classic is just impossible to escape. Next to where else but a great Punjabi wedding song: Gud Naal Ishq Mitha. Navraj Hans and Harshdeep Kaur give us some classic Punjabi bhangra in traditional style: traditional instrument, traditional words, traditional language, traditional bhangra. For once, the music director has avoided trying to modernise a classic and failing possibly because once again this is such a well-known classic. Again, the words “Gud Naal Ishq Mitha” say it all and so many have loved this song even more than sweets that trying to change it would have just broken it. So escaping the classics comes Vishal Dadlani and Shannon Donald with Good Morning. If this can’t get you out of bed, springing to your feet then it has failed in its one and only purpose. A short, sharp and bright song its uplifting and finds a great balance between the singer and the country band arrangement behind him. This song knows what its for and single-mindedly goes after that purpose. From previous examples it seems obvious that to change up a song without ruining it is putting some or all of it into Punjabi lyrics. Thus we have Chitthiye by Kanwar Grewal, a sort of re-look at Chitthiye Ni Dard by Lata Mangeshkar from the film Henna. This captures the endless sadness of love letters. It is comfortably the longest song at over 5 minutes and is very sad throughout. Little instrumentation in the form of acoustic guitar and tabla is in use so there’s no relief to be found anywhere within it. However, it still sounds distinctly Kashmiri or even Afghan, so the words seem a bit out of place, even with a male voice employed. No need to fear though as the album ends with House Party Song. Sukhwinder Singh, Arjun Kanungo and Parry G give the club beats, the synth and the powerful voice to make this one to get audiences dancing in the isles. Probably an ending song to give it all a happy ending, it doesn’t seem to have any purpose of its own outside of bringing relief from the super tension of what is likely to be an explosive climax. The message of get drunk and be free may not be particularly PC but in this case is likely to be the only way cinemagoers would expect an ending to be. It must be said that with such a difficult topic any music requirement is going to be a hard ask for even the best of music directors. To add to it the title song and the title itself are such an irony that somehow needs to be maintained without actually copying the original. But it could be seen that Rochak Kohli has taken some advantage of that here having 3 remakes, none of which will make the listener forget the original. And aside from these the other 2 songs hit their purpose exactly but as songs otherwise don’t have any use to add to audience memories. Overall though, the skill that Rochak has shown in leaving the taste of the old, blended seamlessly in with the new and that the remaining songs do serve a purpose means that this album does well. 15 queries in 0.419 seconds.